Bobby Orr put Parry Sound on the map, as far as sports fans of North America are concerned. The Superboy of the Boston Bruins is by no means the only big-time athlete from that part of rural Canada—Gary Sabourin, Terry Crisp, Gerry Odrowski, Keith and Bill McCreary and Bill Barber are others—but he’s by far the most prominent. 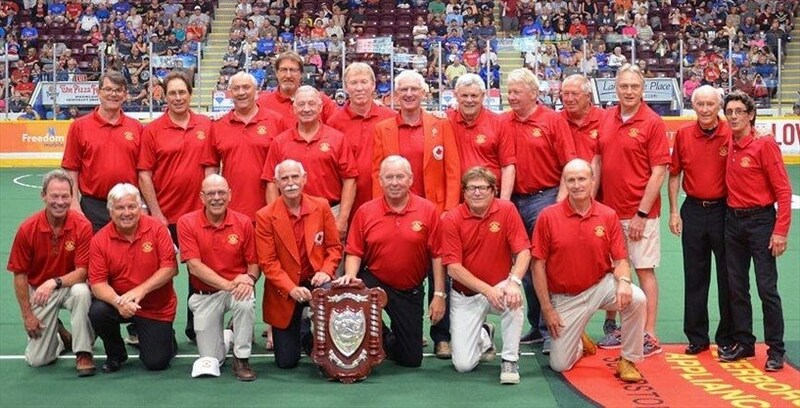 But a quarter of a century ago, when I was growing up among the trees and lakes of the Parry Sound area, our sports heroes were Wilfred (Bucko) McDonald and Jack Bionda, lacrosse superstars who later made their marks in the National Hockey League. 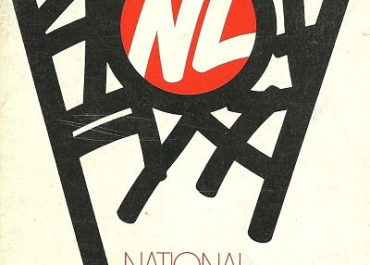 McDonald, by then, was the distinguished Member of Parliament for Parry Sound but his decade of NHL employment had ended as recently as 1945 and that endowed him with legendary status, as far as teen-aged idolators were concerned. Bionda, the son of a well-known fruit and vegetable merchant in Huntsville, was only 15 in 1949, but he already was playing lacrosse against the seniors. 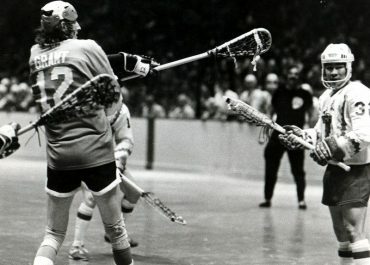 Like McDonald, he was a superbly gifted attacker in a lacrosse box and he was the reason little Huntsville could compete successfully against cities 100 times its size. In 1949, Bionda began to play hockey and his career continued to parallel that of McDonald. He learned to skate very late in life and never successfully mastered that skill. Lacking the grace and speed which had been his main lacrosse assets, he became a defenceman on the rinks. But Bionda was a splendid athlete, quite capable of overcoming his deficiencies, and he was conscripted by the Maple Leaf organization. He worked his way up through the sequence of feeder clubs that was customary in those days—junior B, junior A, minor pro—and finally was elevated to the Leafs’ NHL roster during the 1955-56 season. Bionda’s debut at Maple Leaf Gardens was memorable for one reason. 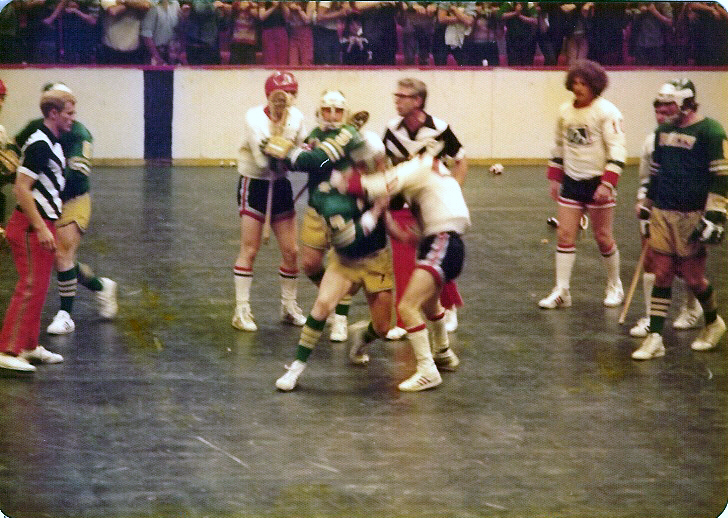 Anxious to make an impression, he picked, or attempted to pick, a fight with Gordie Howe his first whirl on the ice. His bravery was considered commendable, if not his wisdom, and he went to work three years with the Boston Bruins before returning to the minors. 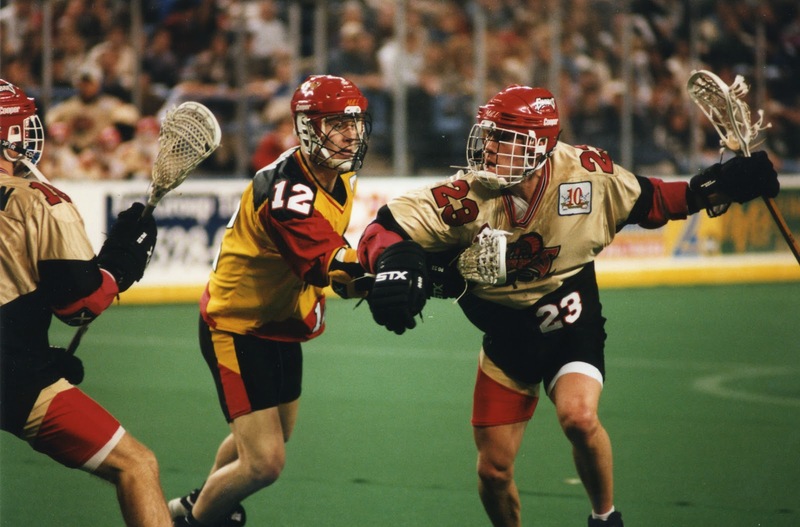 Bionda continued to earn a tidy living in lacrosse, mostly in British Columbia, and when the National Lacrosse League was being set up this year, his background and know-how were deemed essential to the operation. 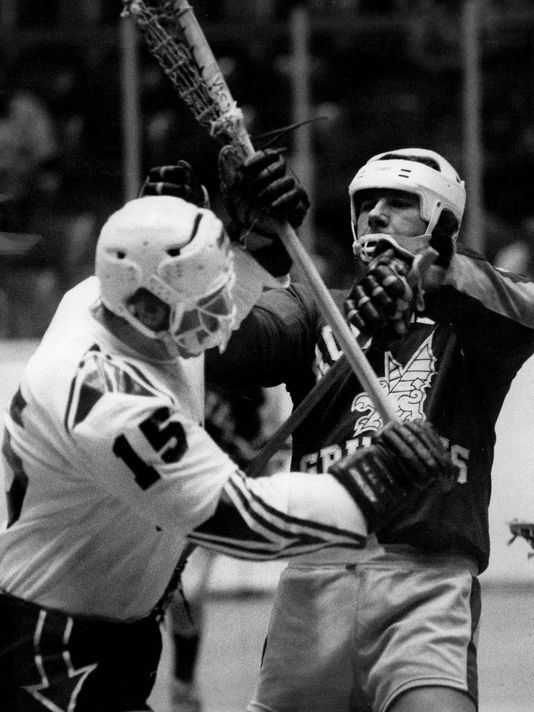 He was imported from Huntsville to help run what’s going to be the NLL’s key franchise in Philadelphia. 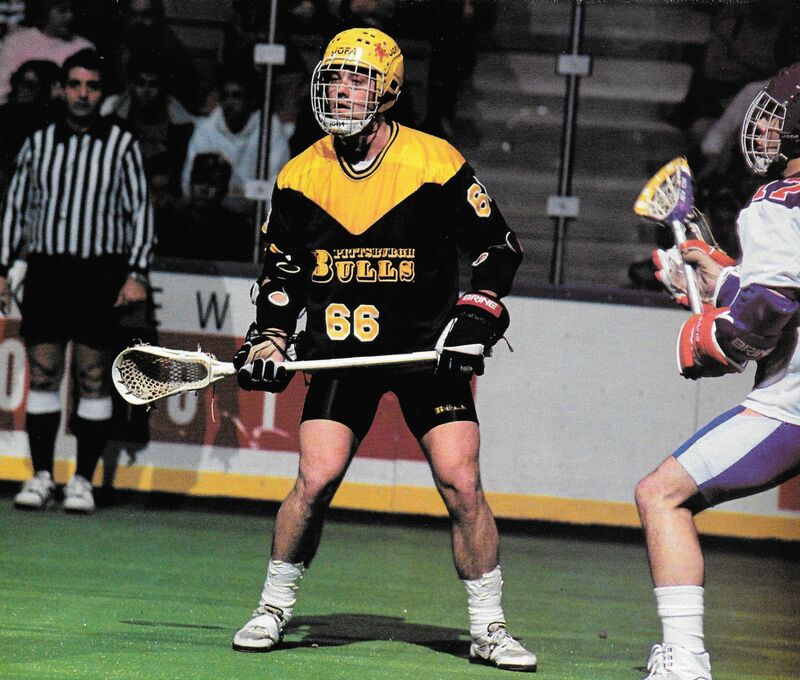 Bucko McDonald had grown up in a traditional hotbed of Ontario lacrosse, Fergus, and moved later to Sundridge, a picturesque lakeside village in Parry Sound district. He was employed as a boxla professional at Maple Leaf Gardens in the early 1930s and the decision was made to transform him into a hockey player, too. It was during this transitional period that the great Bucko suffered the most grievous injury of his entire sports lifetime. Red Horner was teaching him the art of dropping to the ice to block shots. Skate blades weren’t sheathed then the way they are now and McDonald, squatting awkwardly, inflicted a long, deep gash on his left buttock. By 1933, McDonald was ready for NHL duty and he was promoted from the minors to the Detroit Red Wings. And in the spring of 1936, with Wings, McDonald played his greatest game ever. In was in the opener of the Stanley Cup playoffs, a tournament Wings eventually won. 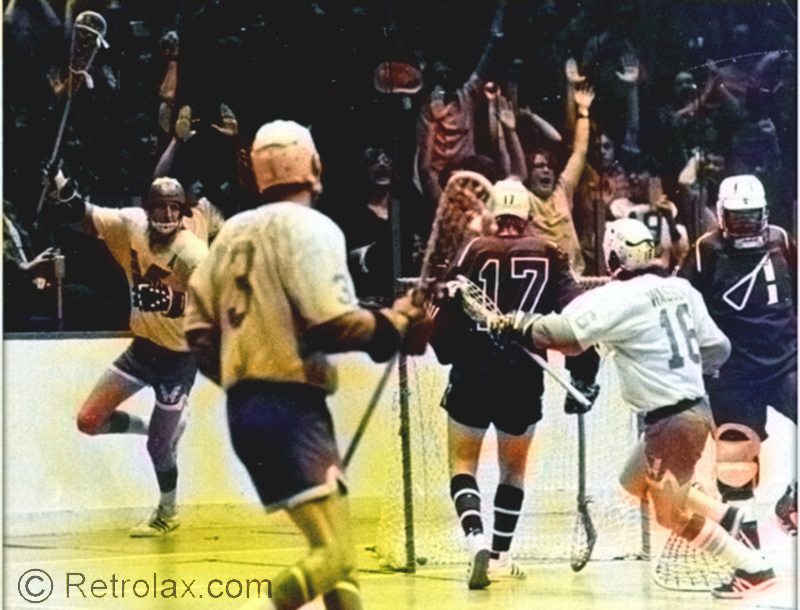 This was the longest professional match ever played, going into the sixth overtime period before Mud Brunteau scored the goal that gave Detroit a 1-0 victory at 2:25 am. The game lasted 176 minutes, 30 seconds, and as it wore on, the players grew more and more exhausted and skated more and more slowly. The ice deteriorated, too, reducing the pace of the contest even further. McDonald, who ran on his skates, reveled in this situation and was able to dish out literally dozens of thunderous bodychecks. No such statistics are compiled, but folks who were there claim McDonald flattened more opponents than anybody did ever before or since in a single game. McDonald subsequently returned to Toronto and then spent some time with New York Rangers before retiring in 1945 and entering politics. McDonald’s hitting technique was to smite his victim dead-on with his spacious chest. Gravity, plus the advancing years, caused this deadly weapon to slip downwards a few inches, but the devastation continued. Ab Demarco of North Bay, sire of the NHL defenceman, says the toughest bodycheck he ever received was from Bucko McDonald, when they were teammates in New York. McDonald didn’t quit hockey when he left Rangers and was elected to the Canadian government. Reinstated as an amateur, he became coach and 60-minute defenceman for Sundridge Beavers, who won several Ontario championships in competition with larger and richer towns. McDonald was an extremely effective representative on Parliament Hill in Ottawa. He didn’t speak in the House on matters like foreign policy and the economy. The government had experts in those fields. But if the Parry Sound wharf needed repairs or South River needed a new post office, Bucko would simply drop in on the minister concerned, talk hockey for a while and then submit his request on the way out, as an afterthought. His technique seldom failed. And there was no doubt that his exploits on the ice won him plenty of votes, too. 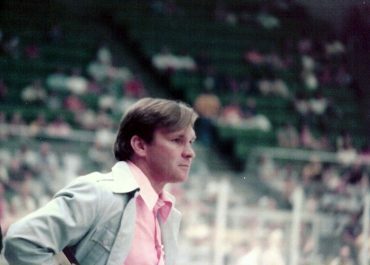 McDonald’s teaching was as crucial to those successes as his wisdom on the blueline. Those Sundridge clubs played the game with intelligence and precision that were remarkable. McDonald’s reputation earned him some professional coaching opportunities, but he didn’t succeed. What he was best at was instruction. He didn’t work well with men who already knew the essentials of hockey. Recognizing this ability of his, the town of Parry Sound imported him the 40 miles from Sundridge to head up their boys’ program and it was during this stretch that he established his final link with the NHL. Under his tutelage, a child prodigy named Bobby Orr learned his early hockey lessons. Many of the skills which astound NHL audiences today were implanted by Bucko McDonald. Maybe the National Hockey League should have found a spot for McDonald, as it did for Bionda. 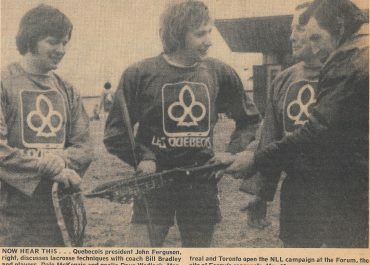 Both are authentic Canadian folk heroes and it all started in lacrosse.